Admiral offer the UK's first complete maintenance free roofline system designed to work together in harmony, to provide stunning looks and superior performance. A complete package with a huge range of styles and options is available, from colours of fascias to different types of gutters all manufactured using superb quality materials, fitted by expert, professional installers and backed by a peace of mind 10 year watertight guarantee. Facscias, downpipes, soffits, bargeboards and cladding are all designed for maximum efficiency, durability and reliability. Maintaining your existing woodwork is time consuming and costly. A rotting roofline not only creates a poor impression, it can also cause structural damage and encourage vermin. 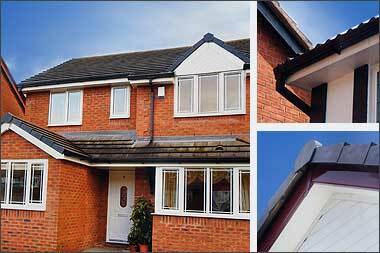 Admiral will replace your old roofline with high performance, low maintenance, top quality, weather-resistant, long lasting uPVC system that doesn't need painting or repairing, whatever the weather. Once installed, your roofline system will not warp, crack, flake or peel and you will save money on maintenance for years to come. You will also be pleasantly surprised just how inexpensive it can be for Admiral to replace your old decaying roofline – Call our FREE hotline now on 0800 731 1969 for a no-obligation quotation.